Here are Cryptolume we want to ensure that the user experience when using our application is very easy, and one of the main items on our roadmap is the UI facelift which is actually an ongoing effort from us to ensure that the UI is as easy to use as possible. If you compare Cryptolume to what it was a few months ago to now, you can comfortably say that we’re the leaders in providing cryptocurrency alerts on moving price action in the market and this is mainly because of our awesome development team, the feedback from our users and the want for having something available that is truly helping people with their trades. Just so everyone knows what’s possible with the Cryptolume user interface, we’ve created this post to show you exactly what’s possible, new and old. As you can see above, you can now hover over the name of a coin on the left hand side and it’ll allow you to go directly to the trading page of the exchange website. 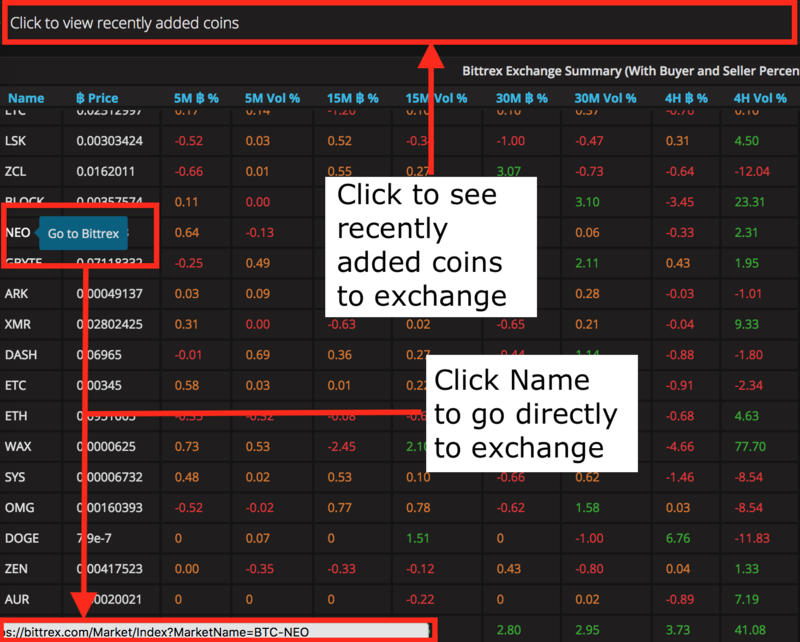 This is now available for the exchange summary pages for all of the ones we support. Another request from one of our members was to have the “Table of Movement” page go directly to our summary page of a coin that they click on the left hand side, so similar to the previous example, except this one takes you to another page of Cryptolume that lets you see a bit of history of the coin on the global market capitalization. We’ve re-designed the home of the Graph App (First page that you access when you login) and have put in information there such as latest releases, quick links to support/contacting us and a link to our YouTube and blog where we post more videos and guides on using Cryptolume. 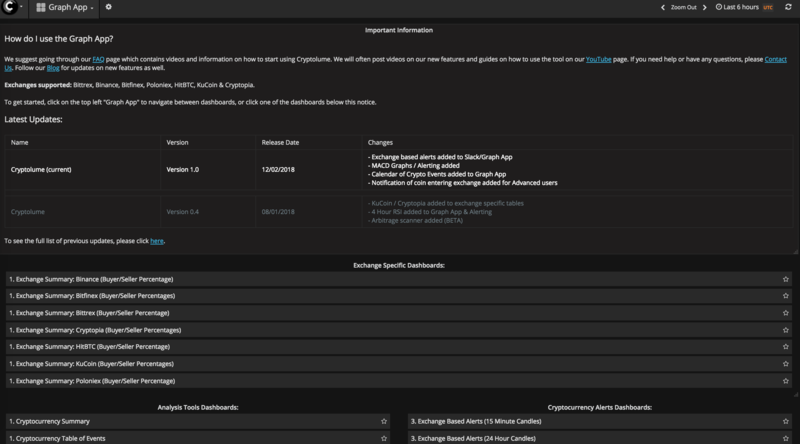 Below are some of the older options that are already available on the Cryptolume UI that you may not know of yet but can help you with what you’re doing. On the dashboards where we have tables, (Exchange summary, Table of Movement, Arbitrage, etc) you can sort by column names and see the descending or ascending order of that certain list. We will continue to make improvements on our UI and will update them on this blog as it comes to happen, so make sure you bookmark us and stay updated. If you have any suggestions please don’t hesitate to contact us via our website or the in-app messaging system if you’re already an existing subscriber.